Argentina pizza has its own identity and it differs from its italian counterpart while it conquers everybody’s palate. Accompanied by beer or moscato wine and fainá, the argentina pizza is made all over the country in various ways and gourmet flavors. Among the many gastronomic routes that make up the Argentine territory, one of the most tempting is the one following the endless flavors of pizzas made, for over a century, in different parts of the country and especially in the City of Buenos Aires. 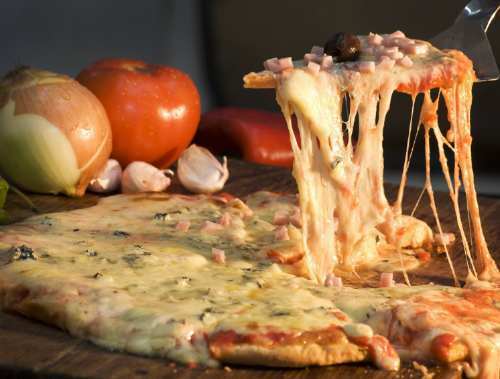 The Argentina pizza circuit has multiple paths and runs across most of Argentina’s provinces, where all kinds of shops that offer this delicacy were erected in recent years. However, for the international tourist one of the best ways to discover the ways and flavors of the pizza in Argentina, there is nothing like a gastronomic journey through the neighborhoods of the city to taste the famous Buenos Aires pizza. It was in Buenos Aires, on the banks of the creek in the neighborhood of La Boca, where a group of Italian immigrants first kneaded pizza on Argentine soil. From Neapolitan roots, Genoese and Sicilian, experts say that over the years Buenos Aires pizza took its own identity and developed its variants to conquer sophisticated palates of all travelers visiting Argentina. According to recent industry studies, it is estimated that the number of Buenos Aires pizza retail places has reached 650 and may, at any time, exceed the number of steak houses or grills. In fact, the average daily consumption per store is around 60 pizza units, indicating a projected figure of 39,000 pizzas daily and an annual estimate of 14 million pizzas in Buenos Aires alone! The earliest references to the traditional pizza date back to the seventeenth centuryin the city of Naples, where it began to be made out of a kind of round cake or bread topped with tomato and, over the years, it also incorporated cheese and some other ingredients and herbs. In Argentina, it is believed that the first pizzas were prepared by Nicola Vaccarezza in 1882. Nicola was a Neapolitan immigrant who had his bakery in the neighborhood of La Boca. At that time, very low cost and basic ingredients were used to make pizza and therefore it was considered a staple for the lower classes. 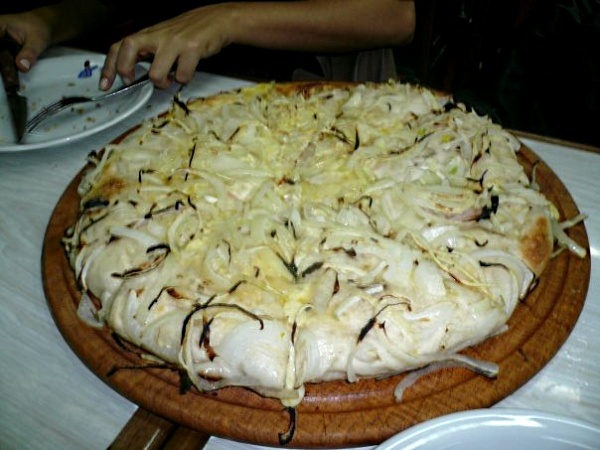 Ten years later, the Genoese Augustine Banchero creates the very first fugazza, using the traditional dough with onions but then he added cheese to it and it became one of the most traditional flavors of Buenos Aires pizza. 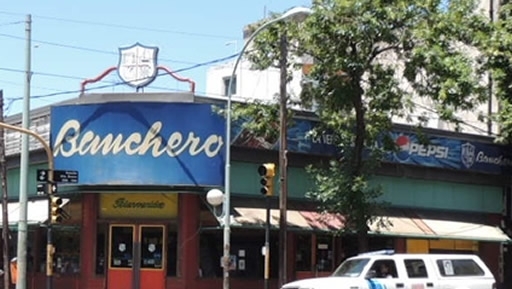 However, the proliferation of pizza places did not take place until the early ’30s, when Banchero himself opened his first pizzeria called “Banchero”, currently one of the most traditional and well known Buenos Aires pizza hangouts. In Buenos Aires the pizza circuit allows travelers to taste and enjoy different techniques, doughs and flavors than those used for pizza in other parts of the world. Some of the distinctive characteristics of the Argentina Pizza are: much lighter dough; different kinds of sauces with a variety of ingredients; and, cheese in abundance. Besides, one of the basic rules for Argentina Pizza is that is presented in a size that permits its division into six or eight portions and share. 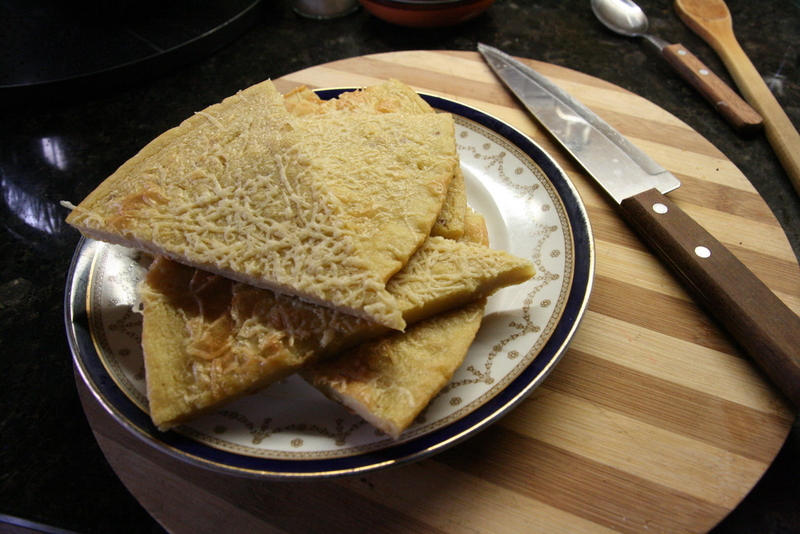 One of the more traditional pizzas is made “in a mold”, whose thickness varies between 2 and 2 ½ centimeters (about one inch) as the dough is fairly leavened. Another technique for pizza-making is the “half dough”, whose height barely reaches half a centimeter (0.2 inches), and is very commonly found in bakeries and supermarkets as pre-pizza (pre-cooked dough). But the favorite Argentine pizza is the “stone-dough pizza” that stands out as the dough is really thin, firm and crunchy. Finally, another Argentina pizza making technique is “grilled”, cooked on the grill with a fairly thin dough. One of the typical Buenos Aires customs, that has even been the subject of books, poems and songs, is eating pizza accompanied by moscato wine – a very sweet and natural wine – and Faina, a pizza dough made out of chickpea flour. This is only available in the traditional bars and pizza places of Buenos Aires, where even the plates are made of metal. While in most places the Argentina pizza is served whole with up to two combined flavors, there are still many places in Buenos Aires where it is served “by the slice”. The cheapest and most common – also a favorite amongst the Buenos Aires pizza – is the “mozzarella” or cheese pizza, with tomato sauce, cheese, green olives and sometimes a little oregano. 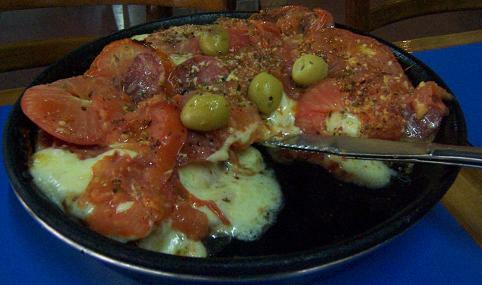 Other popular Buenos Aires pizza varieties are: cheese and onion or fugazzeta, especially with ham, cheese, tomato, olives and peppers. The flavors combine gourmet mushrooms, meat, greens of all kinds, various cheeses, black olives, hearts of palm, egg, garlic, sausage, ham and pineapple. We hope you enjoy your gastronomic journey through the Buenos Aires pizza!